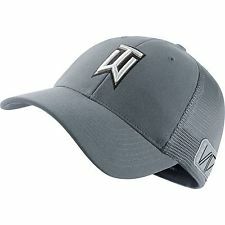 Gray Nike Tiger Woods “TW” cap 2014, July 17, 2015. (http://ebay.com). Okay. So my wife calls me “the last true Tiger Woods fan” in her tweets about me watching Tiger struggle mightily to find his authentic swing and rhythm again, a process that supposedly was over in 2013 (when Tiger won five tournaments). But since the calendar flipped to 2014, Tiger may well be angrily muttering to himself, “Where have you f**ing gone, Eldrick ‘Tiger’ Woods?” All as he spends yet another week looking for balls in bunkers and hazards, hooking and slicing driver and 3-wood like he’s working on differential mathematics for NASA’s next deep space probe. 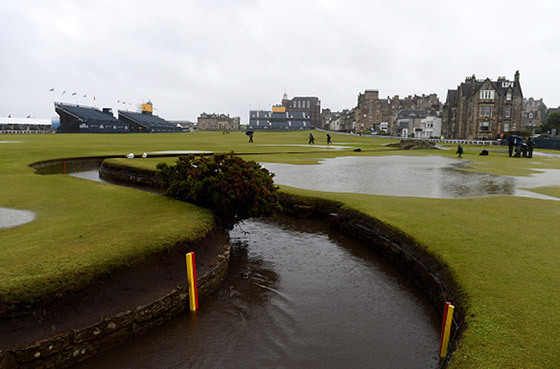 The loop water near the 1st green at St. Andrews’ Old Course, (where Tiger put his second shot of his 1st round), Scotland, UK, July 17, 2015. (http://golfdigest.com). For years I have thoroughly enjoyed watching Tiger’s dominance in a sport dominated by Whites and Whiteness. I have used and sang stock phrases and songs whenever Tiger’s competitors (e.g., Phil Mickelson, Luke Donald, Bubba Watson, Sergio Garcia, ad infinitum) have found the drink, deep grass, impassable fescue, and have gotten the yips with two-and-a-half-foot putts to tie or take the lead at a major. Watching Tiger play like he’s fifteen years older and ready for the Champions Tour right now is like, well, watching any other professional golfer play.